A new study of pedestrian and bicycle travel suggests investment in infrastructure and policies to encourage walking and biking are correlated with lower rates of pedestrian and bicyclist deaths. 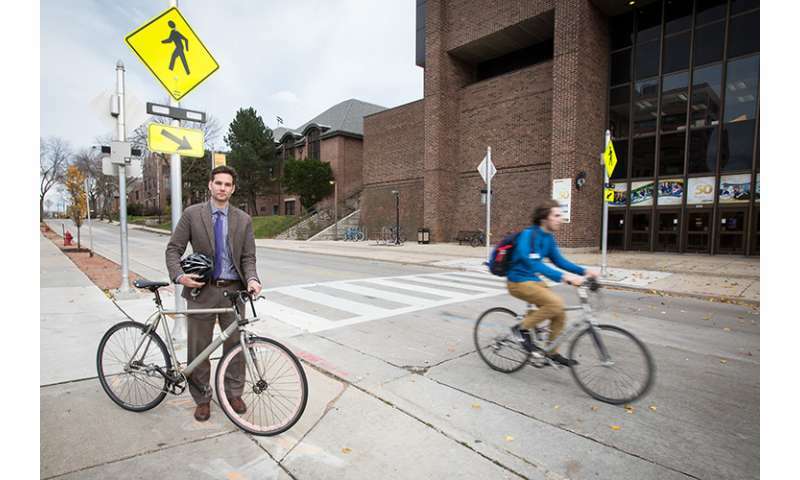 The work by researchers UW-Milwaukee and UW-Madison also identifies the safest and most dangerous metropolitan regions for pedestrians and bicyclists in the U.S. Using improved travel data, Robert Schneider and Aida Sanatizadeh of UW-Milwaukee's School of Architecture and Urban Planning and Jason Vargo of the UW-Madison Global Health Institute calculated the rates of fatalities for walkers and bicyclists in 46 American regions with populations greater than one million. The fatality rates varied dramatically. "First, we did an informal comparison of fatality rates and were surprised to find how different the regions were from top to bottom," said Schneider, an associate professor of urban planning at UWM. "The five most dangerous regions for walking had an average fatality rate five times higher than the five safest regions. For bicycling, the most dangerous regions had a fatality rate six times higher." But Schneider notes that the data for certain regions was less reliable than others because of limited survey data. "So we used a more rigorous method called meta-analysis to identify regions that stood out as much higher-than-average and much lower-than-average." Chicago, Minneapolis and New York were among the safest for pedestrians, while Portland stood out a safest for bicyclists. On the flip side, Jacksonville, Orlando and Tampa were among the most dangerous for walkers and bicyclists. Milwaukee ranked in the middle of the pack on both measures. "We compared our lists of the safest and most dangerous regions with the 'Walk Friendly Community' and 'Bicycle Friendly Community' rankings, which are based on the investments cities make in infrastructure and programs," Schneider said. "The general connection between high rankings and low fatality rates is a good indication that those investments have paid off." Schneider also raises another possibility: "Communities that were developed in a more pedestrian- or bicycle-friendly pattern to begin with – typically older urban areas – may have chosen to continue to invest in walking and bicycling, meaning that the relationship may work in both directions." Schneider noted that the findings for bicycle safety, while generally in line with the pedestrian rates, were not as robust because of smaller sample sizes. The study uses data from the National Household Travel Survey, which includes recreational, shopping, school and social trips in addition to the "journey-to-work" data collected by the U.S. Census. "Including non-work trips allows you to calculate a more accurate estimate of fatalities per trip, per minute, or per mile," Schneider said. Analysis of all 46 regions also provided support for the "safety in numbers" hypothesis: More pedestrian and bicyclist traffic overall is related to lower crash risk for each person walking and bicycling. When the researchers examined socio-demographic characteristics, they found evidence that higher senior-age populations, higher poverty rates and higher rates of people born outside of the U.S. were correlated with higher pedestrian fatality rates. But the study did not examine causal connections.